Follow the jump to read the entire commentary! SPOILER WARNING. "Before I wrote a single note for the actual game, I spent a few weeks working on an overture, the idea being that the overture would serve as a template and musical overview of the entire game. It's almost ten minutes long and has all the major themes, character arcs, emotions and plot twists that exist in the game. This track is the first sixty seconds of the overture, exactly as it existed when I composed it. I simply re-recorded it with the final instruments (it was originally written more than two years ago). It seemed an appropriate introduction to the new world of Tomb Raider. Lara's theme plays in the middle register of the horns in a very simple, understated role." "The first half of this track was recorded exclusively with a custom sculpture I commissioned, simply called "The Instrument." The intent was to place the player in a completely unrecognizable and new sonic space with the music. 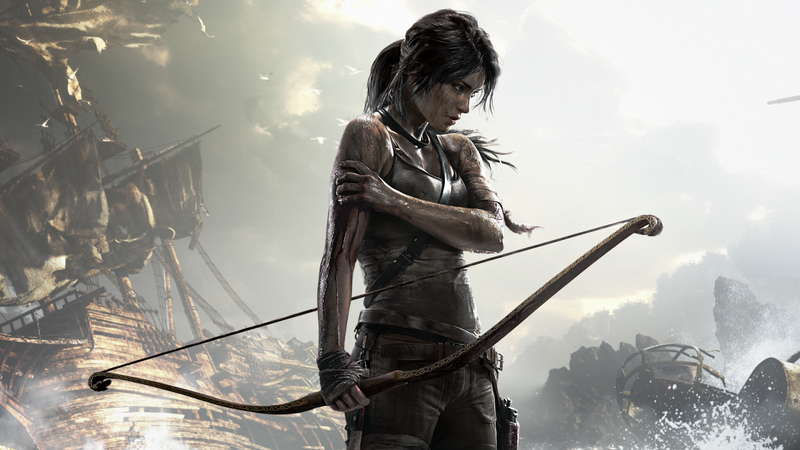 Lara is trapped in a cave and racing for her life to escape. The alien tones elicited from the instrument are intended to wipe the musical palette clean, both literally and figuratively. Then, once Lara is safe, I was free to present the new main theme for Tomb Raider, stated as simply and intimately as possible on solo piano." "This was one of the first pieces I composed specifically for in-game use. It's also the first piece that I recorded myself performing all of the percussion instruments. Many of the drums and shakers you hear in this piece went on to become essential staples of the "Tomb Raider percussion" set of sounds. There is a subtle and tentative use of Lara's theme in the flute." "This is a combination of two different pieces. Lara is introduced to Mathias in the first half, with harmony that is intentionally open-ended and unsure of itself - just as Lara is unsure of Mathias' intentions. Around the 1:30 mark, the island theme (in low horns and strings) plays concurrently with the Sun Queen motif (the higher register string swells) as Sam details the Sun Queen's history. 2:20 to the end is the entire scripted sequence of Lara's first kill in the game. This music was originally showcased in gameplay previews but left out of the final gameplay due to changing mechanics and implementation. The scavenger textures are in full force here, emphasizing the brutality of Lara's assailant. A mournful solo cello takes up her theme as the full weight of Lara's actions comes to bear." "This is a sequence of several cinematics in which Lara and her mentor, Roth, discuss their plans. I've always been extremely fond of the French horn and jumped at the chance for a plain, noble statement of Roth's theme with solo horn. At 2:36, the glass bowls from The Instrument make their first major appearance in the score (representative of the Island itself) when Roth presents Lara with his climbing axe. Lara is taking her first steps to fighting back against the Island." "Lara is in full-blown stealth mode, surreptitiously exploring an old WWII bunker. Scavengers are at every turn and appropriately so are their musical counterparts. Detuned dulcimers and scratchy solo strings accompany the percussion and sounds of The Instrument, adding a palpable threat to the mix." "I'm always looking for an excuse to use stopped French horns. They give the Island theme just the right amount of mystery and snarl. Lara is beginning to be more assertive now - she finally has a proper objective (climb the radio tower and send an SOS). Accordingly, the orchestra (which is really Lara and her intent to survive) takes a more forward role in the music. The Instrument and additional percussion are still present, but quietly ticking away in the background. 1:22 is the first fully realized statement of Lara's theme as the entire orchestra plays together in slow, building chords. 2:00 to the end is the SOS tower sequence. I composed three different versions for this gameplay. The first was very tentative and eerie, the second much more confident and assertive and the third a happy medium between the two. This is a major milestone in the game and we wanted to get the tone just right. In the end, various pieces from each version were cut together. The second, more confident version is presented here, slowly building with Lara's climb and gaining confidence with her ascent. One of my favorite moments in the score is 4:10-4:40, when Lara successfully sends the SOS. Hearing it played back in the game was one of those "composer's dream" moments. Majestic views, a hero overcoming her fears and succeeding...if only for a few moments!" "Yes, Lara does raid tombs! Cinematics are where I really feel like I can stretch out and work all the major themes. Lara is unlocking the secrets of the island, accompanied by the Island theme and hints of Mathias' theme, both stated quietly in solo woodwinds and French horn over the glass bowls of The Instrument, which directly represent the island itself. I particularly enjoy superimposing themes on top of each other. 2:45 is Roth's theme (in the ever-noble solo French horn) and Lara's theme (standard "pre-transformation" solo flute) complementing each other." "After a few cinematics concerning Sam's kidnapping, we begin The Descent at 2:00 - an exhilarating interactive sequence following Lara down a river, into an empty plane and ultimately parachuting her way to safety. The entire two minutes of gameplay was "micro-scored" - individual stingers and short pieces were composed for every onscreen event, from Lara shooting out a river blockage to successfully pulling her ripcord. This was the first bit of fast, interactive gameplay that was scored this way (as opposed to using bits and pieces of longer music tracks to somehow fit the action). The reaction was very positive and this sequence proved to be a template for the rest of the game." "Ah, low stopped horns, how could I so easily underscore evil and menace without you? The "sacrifice" motif - slow, falling low brass - appears at 0:35 as Mathias is telling Sam about her duty as an heir of Himiko. Lots of themes in play here as the action moves from Mathias to Lara's attempted rescue of Sam. Another favorite moment of mine is the wonderfully over-the-top statement of the Island theme at 1:55, followed by the huge, swelling low brass playing the sacrifice motif at 2:11 as the fire underneath Sam is lit. The second half of this track has Lara sneaking in and rescuing Sam. Mathias' theme is played by stopped horns at 2:54. Mathias' theme is simply the Island theme's four notes played backwards." "I had lots of fun with live percussion on this track. Not a single traditional instrument in the first thirty seconds - garbage cans, bowed chicken fencing, detuned solo violin and The Instrument take center stage to illustrate the aggression and violence of the Scavengers." "This piece hints at the energy and determination Lara will eventually gain by the end of the game. It plays during the "rescue" helicopter sequence, though obviously things go awry quite quickly as the island unleashes its full force, echoed mysteriously by the bowls from The Instrument at 0:58. Roth's theme is at its most aggressive at 1:25 as he fights to save the unconscious Lara, ultimately sacrificing himself for her (note Lara's theme in quiet, solo flute). Both of their themes play simultaneously at 1:50 - one of my favorite thematic devices." "The beginning of this track was very refreshing to score. Lara is helping the others fix the boat and spirits are seemingly brighter. But don't worry, things tense up again as Lara begins to explore the beach at 1:38. Bowed dulcimer, detuned contrabass and the ever-present Instrument seemed like perfect partners to underscore the Scavengers as Lara progresses towards the Endurance. Remember what I said about superimposing themes on top of each other? My favorite example is at 4:37 with the Island theme augmenting and reharmonizing Lara's theme. This plays when Lara catches her first glimpse of the Endurance since she was marooned on the island. The track concludes with a haunting, quiet statement of Roth's theme. I liked the idea of his death weighing heavily on her shoulders and sprinkled his theme in during Lara's moments of reflection or doubt." "With a track name like this, there's obviously going to be a lot of Instrument love going on in the percussion. Indeed, the first minute is six different tracks of me banging away on the Instrument plus a few other drums and low strings. This plays under a particularly fast paced bit of combat - emphasized through the angular rhythms and agile, acrobatic French horns and violin runs." "'Hey, hear that? You've just moved into a whole new area of the island you've never seen before.' That's the general intent behind this entire track. From here until the end of the soundtrack we are officially in Oni territory - ancient, sworn protectors of the island and its Sun Queen. That means the glass bowls (the island) and metal pipes (the Oni) are in full effect, plus a healthy dose of taiko drums for heft and weight. In the beginning I'm rubbing wine glasses tuned to specific pitches - the bowls were too thick and wine glasses seemed like the next best thing." "This was originally titled "Whitman's Demise" - after John Williams' penchant for giving away key character deaths in his track titles. Crystal thought it was a bit TOO on the nose, though. This is the final time Whitman's "exploration" motif resurfaces (the low, bubbling figure at the beginning of the track, repeated at 3:35) and culminates in an appropriately disastrous fashion at the end of the track. 2:08 is the only true "inspirational" version of Lara's theme, as she gathers herself and makes a plan to rescue Sam." "This was the final gameplay sequence I scored. Crystal wanted the music to really push forward and take on a life of its own, literally propelling Lara up the mountain. It was another series of micro-scored gameplay sequences, with each checkpoint and action independently scored with custom musical gestures. The piece plays out exactly to the reference gameplay I received from Crystal. What's wonderful about the implementation is that it will never play the same way twice, constantly ebbing and flowing with Lara as she triumphs or falters." "The opening is the final boss cue - the giant Oni samurai. This battle was scored with three discrete layers of music that switched as you progressed through the fight. I laid them out end-to-end and shorted a few to make the track fit on the album. 1:58 to the end is the original version of "Saving Sam," which previously had a drastically different title and ending. The final, in-game version was more than a minute shorter." "This piece is also significantly shorter in the final game. The four major themes are all restated and wrapped up. The Island theme at 0:52 - now in a major key and sounding a lot less deadly, even beautiful. Roth's theme at 1:10 - also in a major key and finally "at rest," building into Lara's theme as, quite literally, the ship sails into the sunset. I'm a huge fan of bookending music and saw a great chance with Lara's final voice over. It was very satisfying to be able to bring back the solo piano from the beginning of the game and wrap the entire score up in a neat, musical bow." "This was, appropriately, one of the last cinematics I scored. It was a bit of a creative doubled-edged sword for me, since I was FINALLY able to score the kind of huge, epic thematic statement I had been looking forward to for almost three years. It was as wonderfully satisfying as it was amazingly brief. But that's ok! Lara has finally earned her theme. Thankfully, Crystal left plenty of room after her last line for it to blast out in full glory. Alex described the intention of this final scene to leave players thinking, "I cannot WAIT to play the next one!"